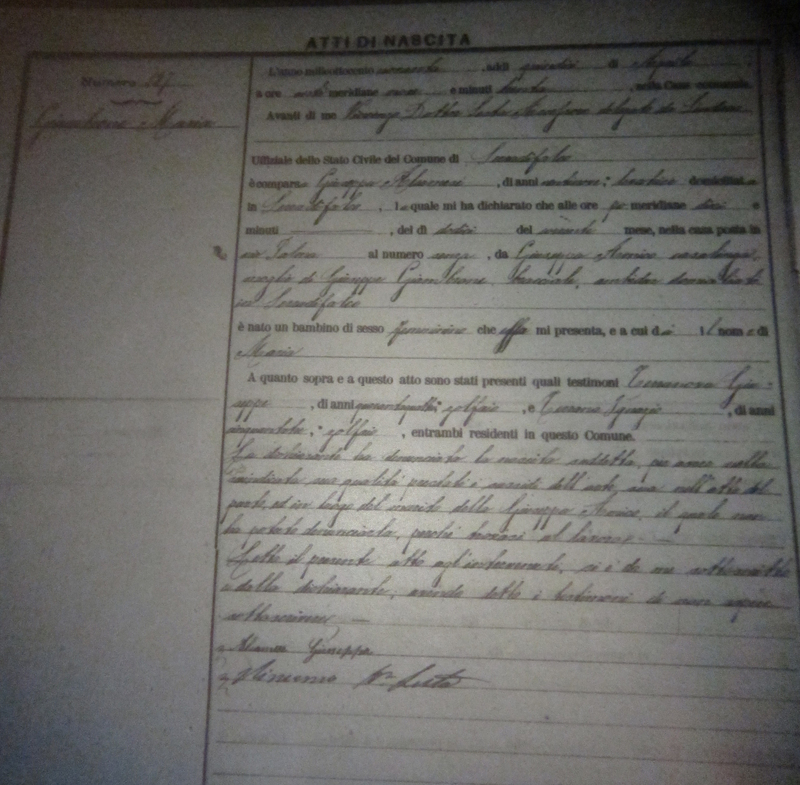 The death certificate for my great-grandmother, Maria (Giambrone) Palmeri, arrives today. This lists her mother's last name as Amico/a (some other things listed it as D'amico). 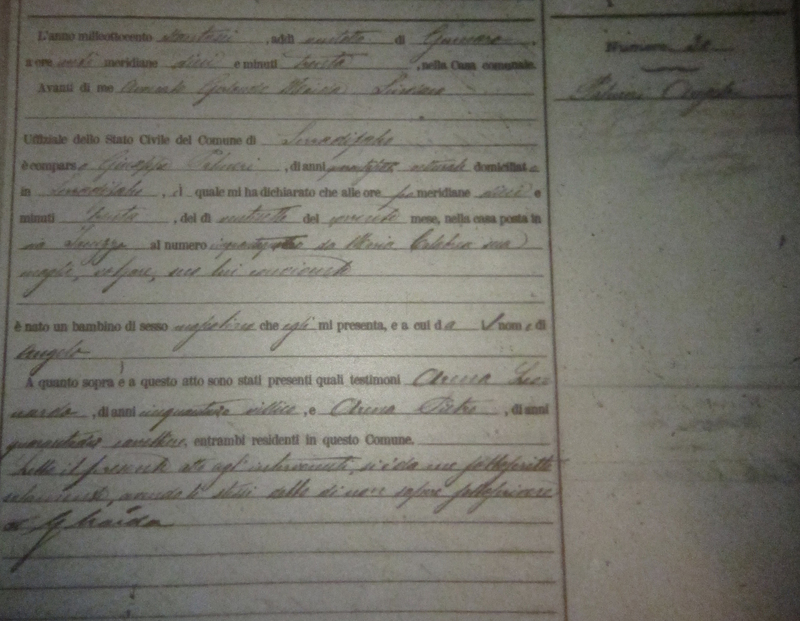 My great-grandparents birth certificates finally arrive from Serradifalco, Sicily. 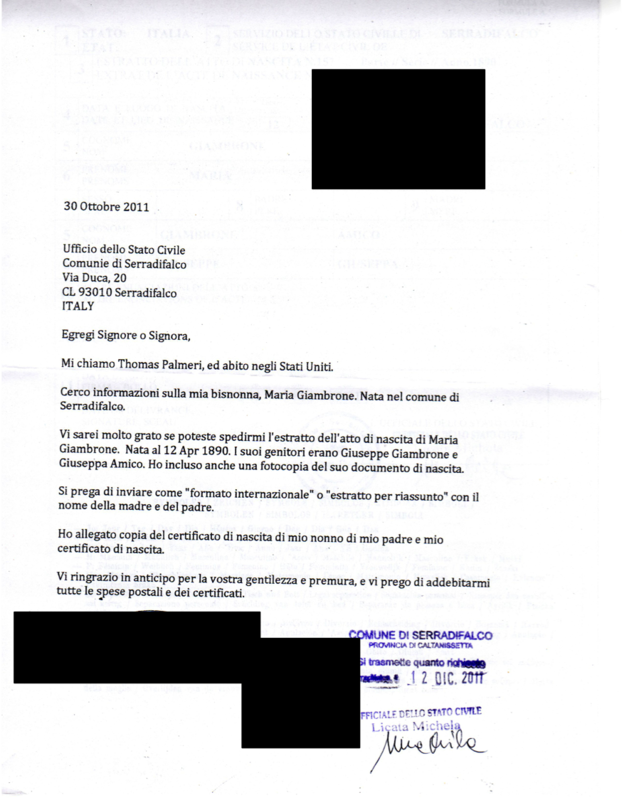 It took three letters along with a $50 order to myitalianfamily that still hasn't come. But at least they're here. One of the first suggestions you get when you start doing genealogy is to talk to your relatives. 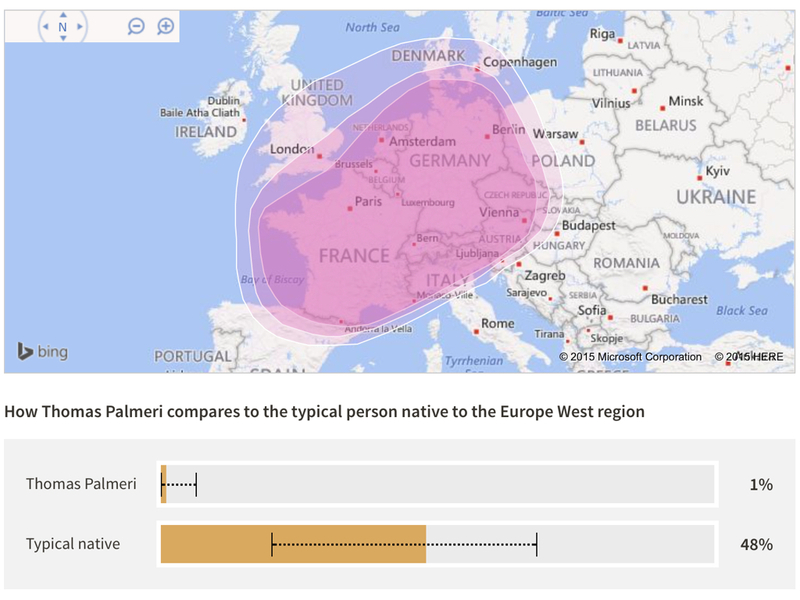 Well, sometimes it takes a little work to figure out who your relatives are. 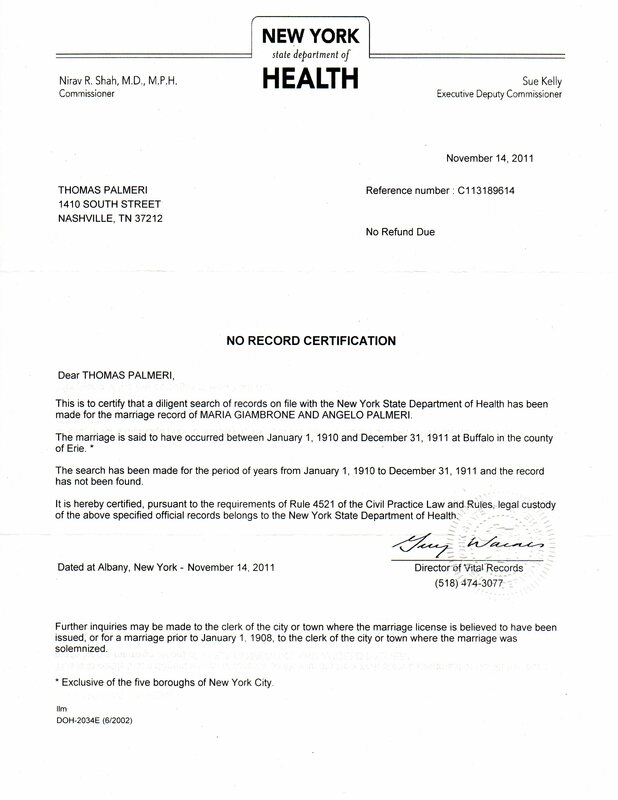 Last spring, I used a brute force approach, sending letters to about a dozen Palmeris listed in the Buffalo phone book. 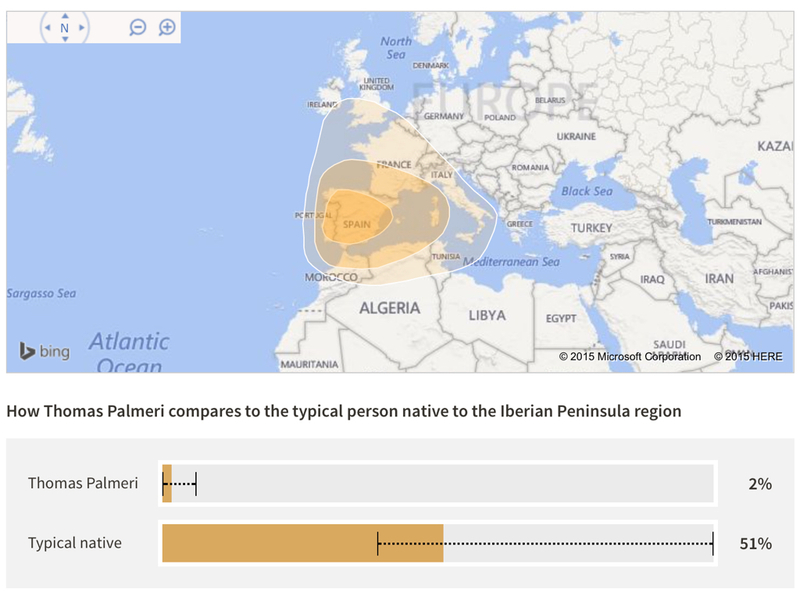 I included a bit of the Palmeri family tree, asking if any of them were related to Charles and Barbara Palmeri, brother and sister to my great-grandparents. 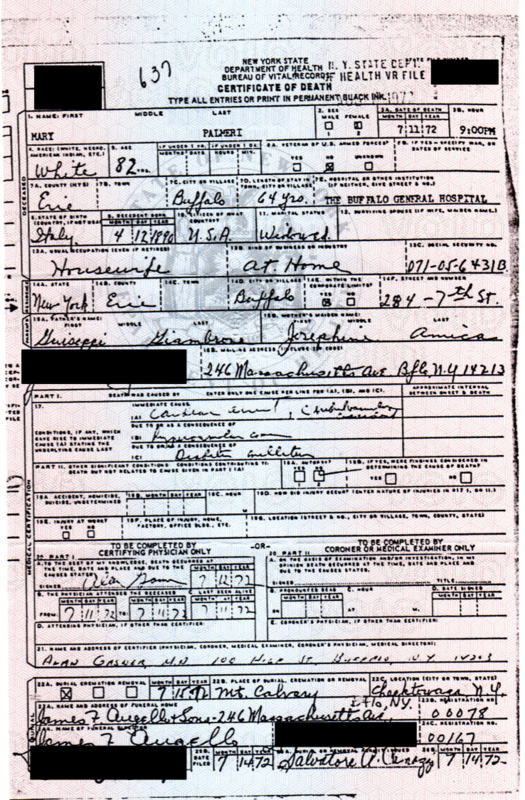 One of the letters apparently went to the son of a second cousin of my father. He passed it on to his father who gave me a call. 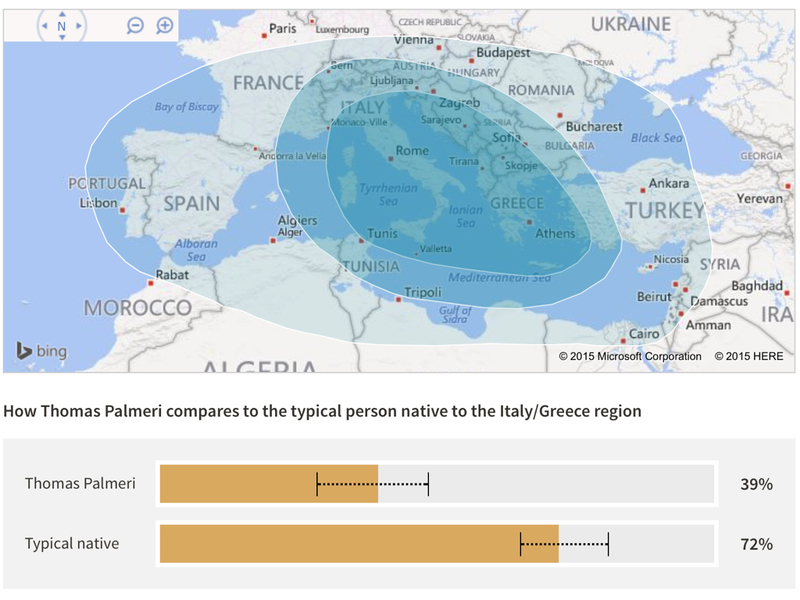 We met over the summer and he gave me a lot of information on the Palmeri family that I talk about in another post. 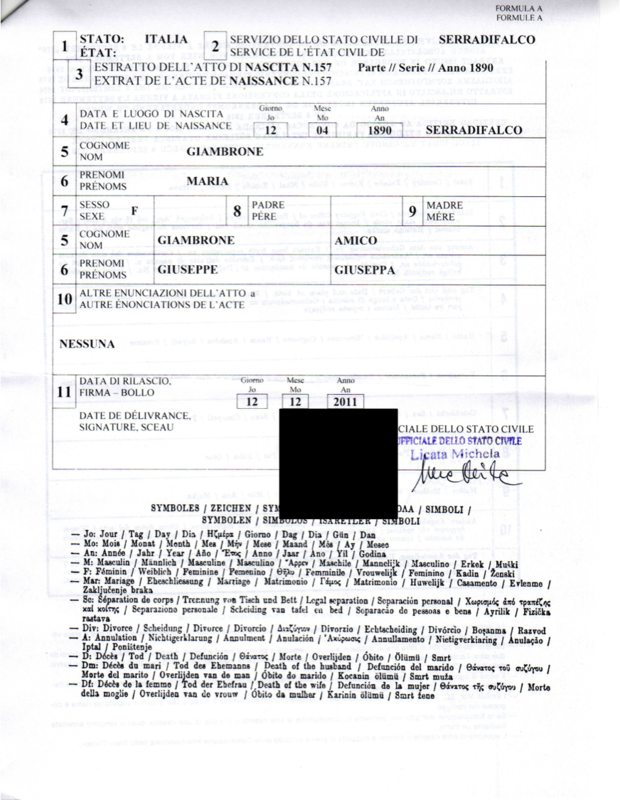 He also gave me some contacts on the Giambrone side. 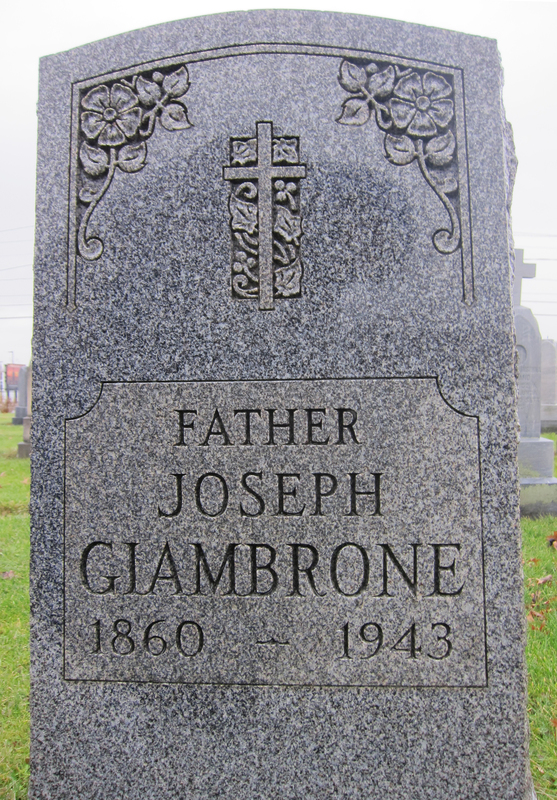 I talked to one Giambrone cousin who put me in touch with another Giambrone cousin. 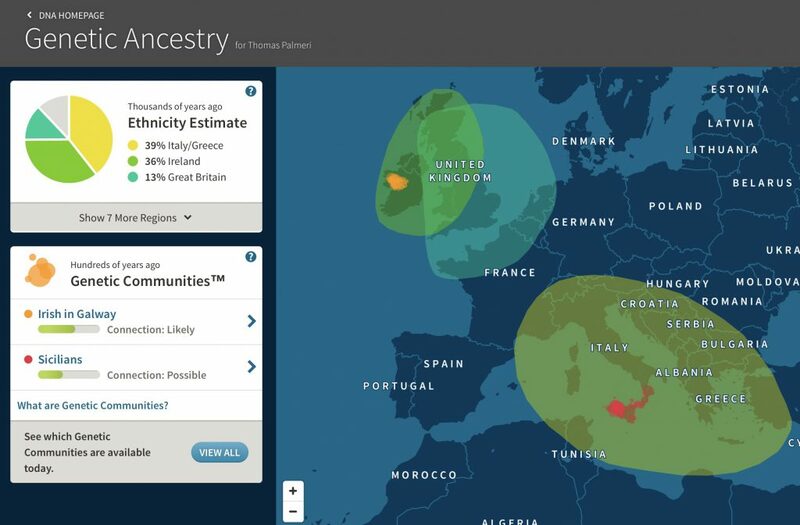 From her, I learned that my great-great-grandfather, Giuseppe Giambrone, and my great-great-grandmother, Giuseppa (Josephine) (Amico) Giambrone, both came to the United States. He died around 1941. 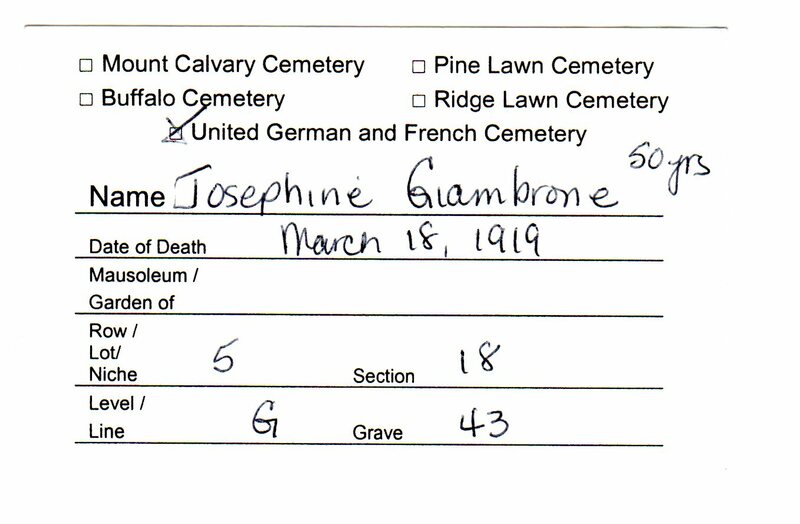 She died before him and is buried in Mount Calvery Cemetery in Buffalo. 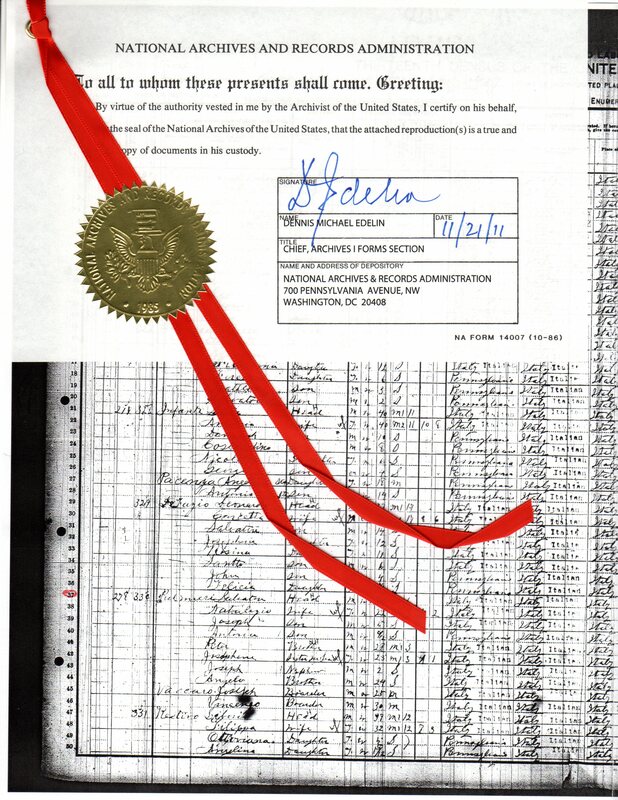 Now I know where to turn to get their death records, which should be filled with information. 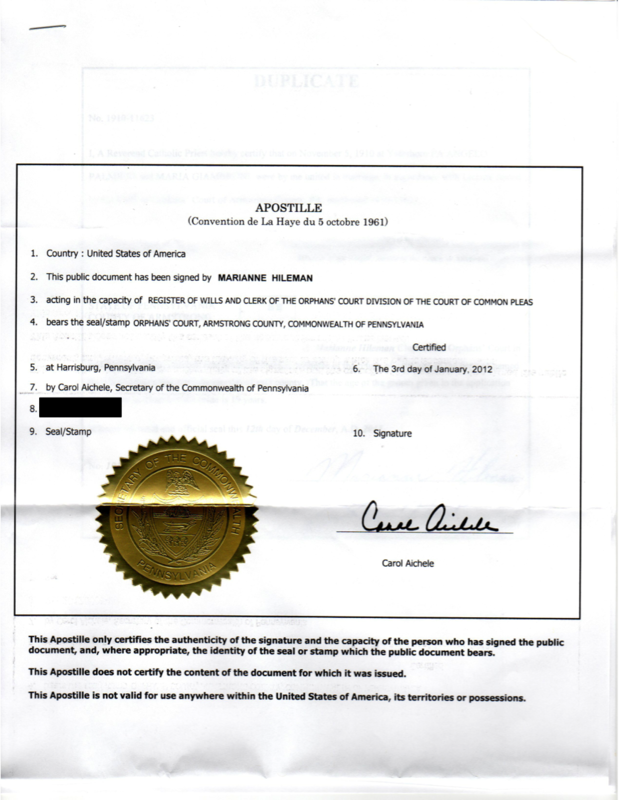 I'm also sending a letter to the cemetery asking them for whatever information they have on file. 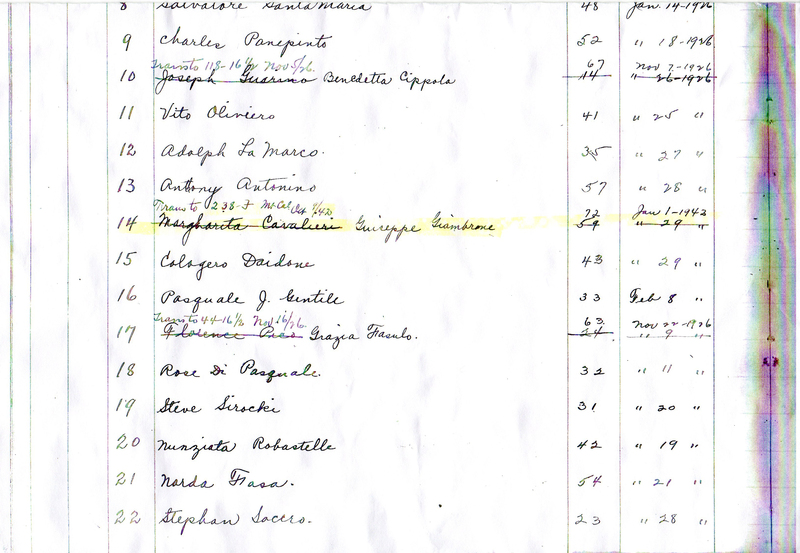 She also sent me a detailed genealogy of the Giambrone cousins. 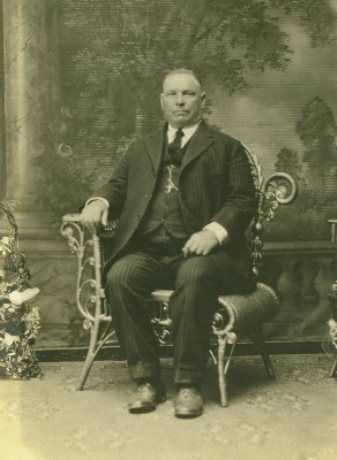 In addition to the useful written information, I got a photograph of my great-great-grandfather! 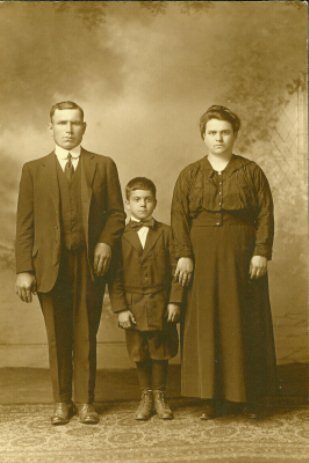 And a photo of my great-grandfather, Angelo Palmeri, my grandfather, Joseph Palmeri, and my great-grandmother, Maria (Giambrone) Palmeri. 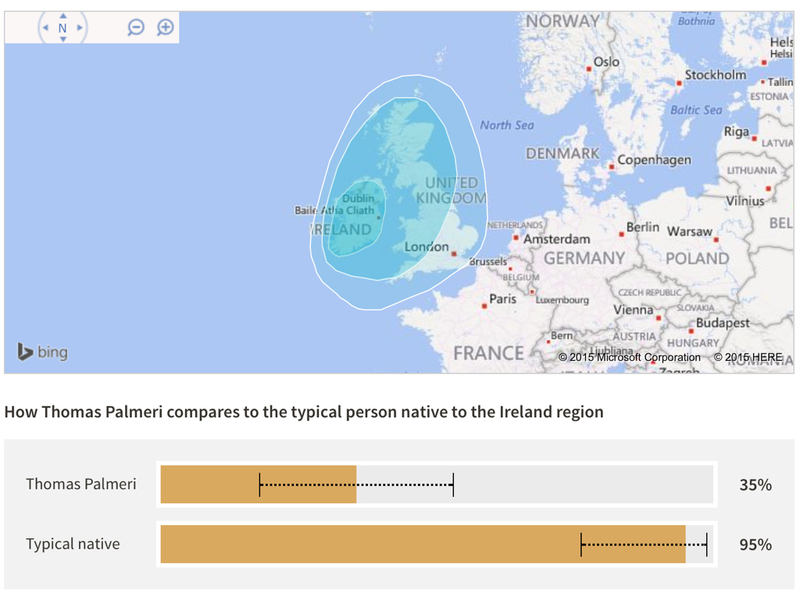 Based on the Social Security Death Index, found by searching on ancestry.com, I know that my great-grandfather, Angelo Palmeri, was born 27 Jan 1886 and died in Sep 1969. 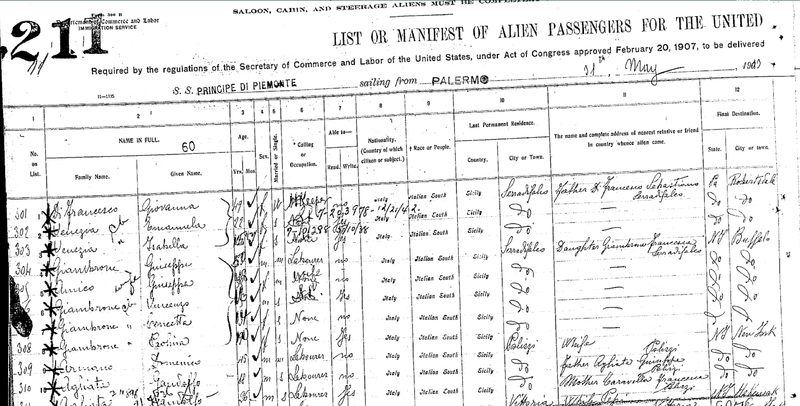 Based on census records, I know that my great-grandmother, Maria (Giambrone) Palmeri, was born abt 1891. I know from talking with with my dad that she probably died somewhere between 1970 and 1975. I try calling Holy Sepulchre Cemetery in Buffalo, where I know my grandfather is buried. 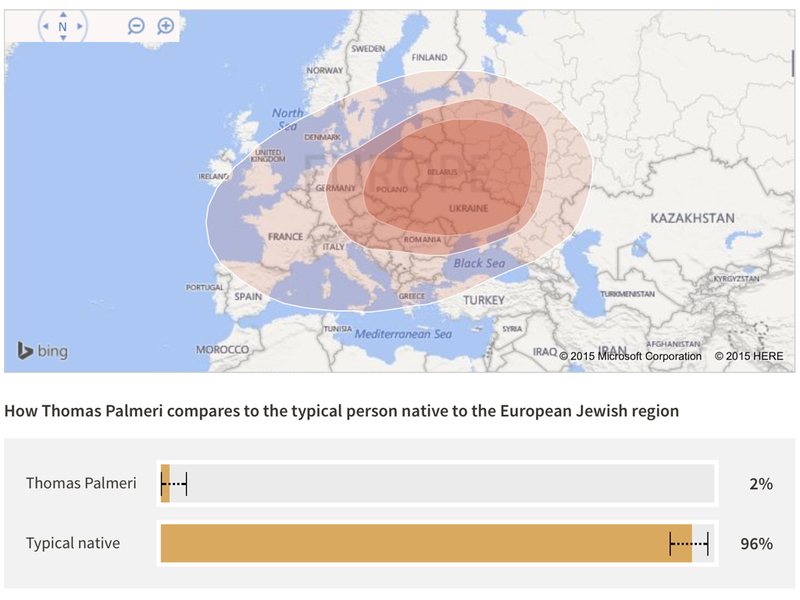 Maybe his parents, my great-grandparents, are buried there as well. No, they're not. 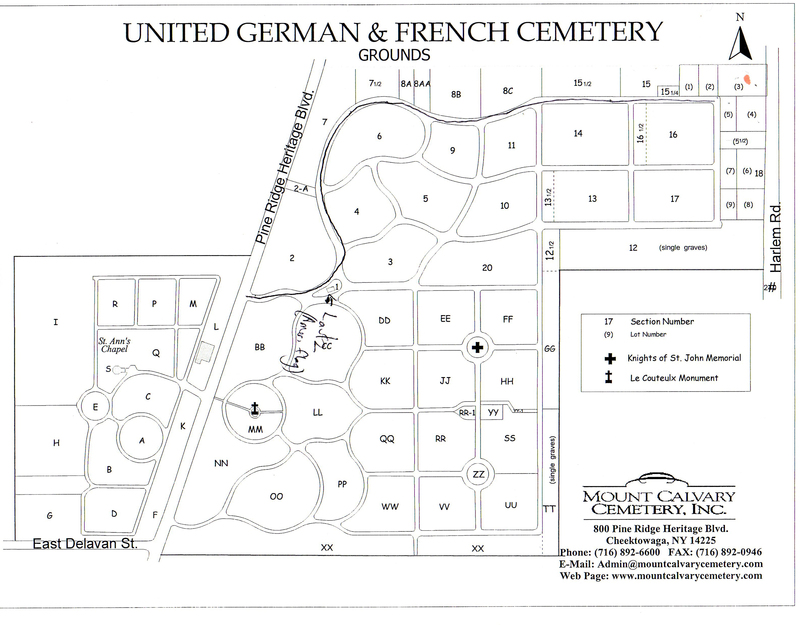 But the cemetery suggests calling Mount Calvary, which is right across the street. I call Mount Calvary. 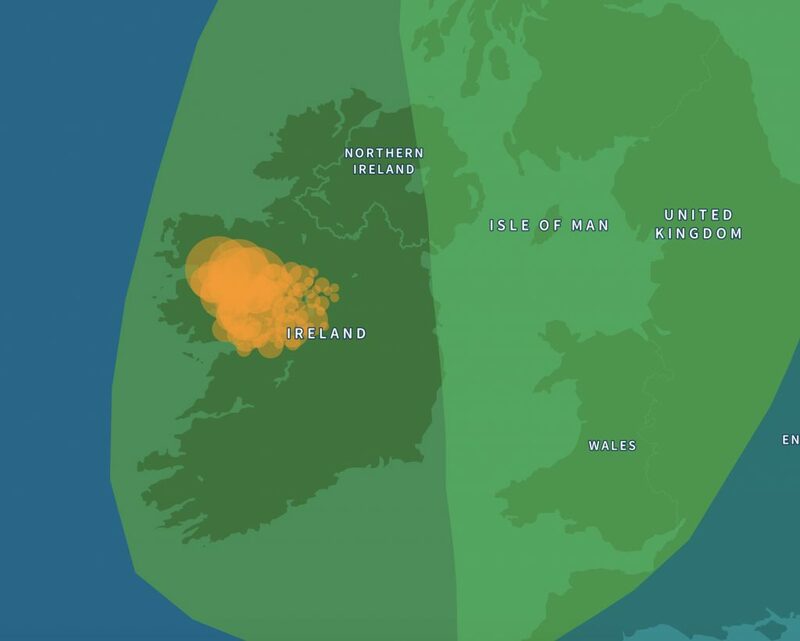 Sure enough, they're buried there. Awesome! 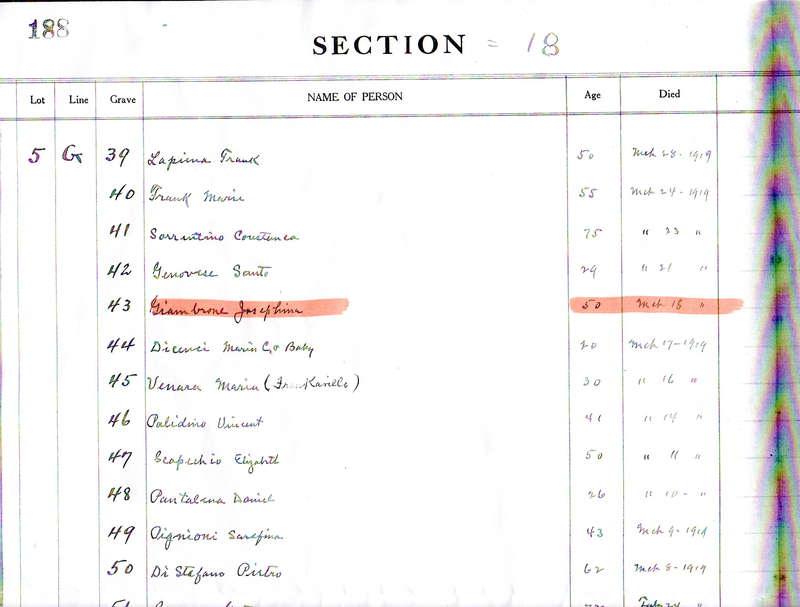 They can tell me that my great-grandfather died 29 Sep 1969 at the age of 83 and that my great-grandmother died 11 Jul 1972 age the age of 82. Unfortunately, they have no record in the office about their birth date. But they give me the location of the grave site. 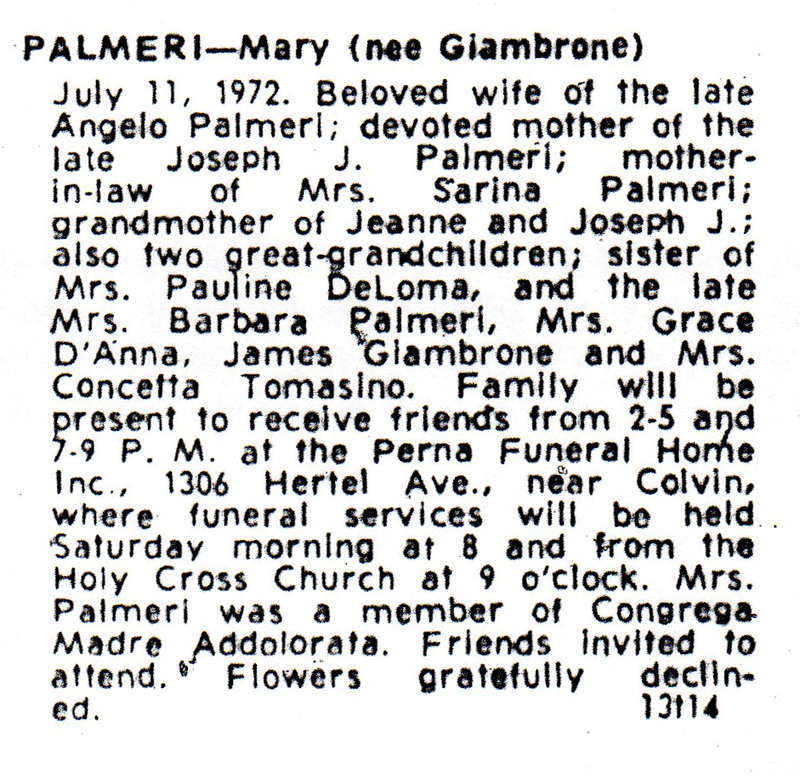 Maria (Giambrone) Palmeri was born in 1890. I don't know the day or month, but this narrows things down a lot from where I was only yesterday. 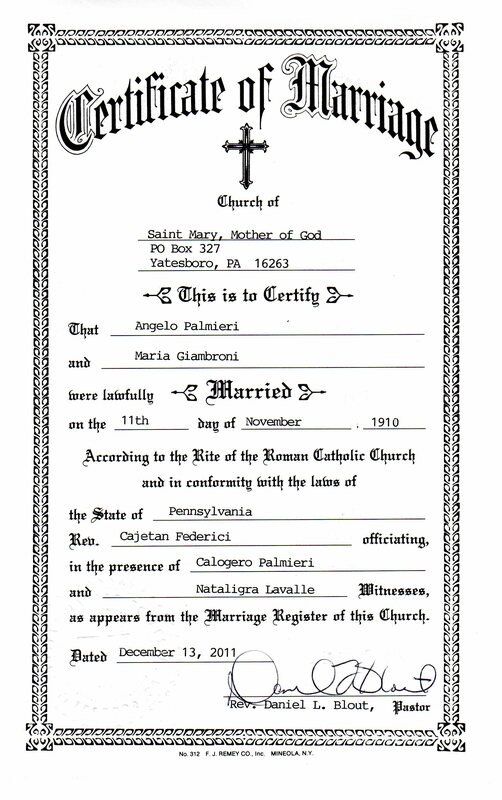 After I learned that my great-grandfather, Angelo Palmeri, had a brother, Charles, and that Charles and Angelo had married sisters, Maria and Barbara, I set about trying to find more information. 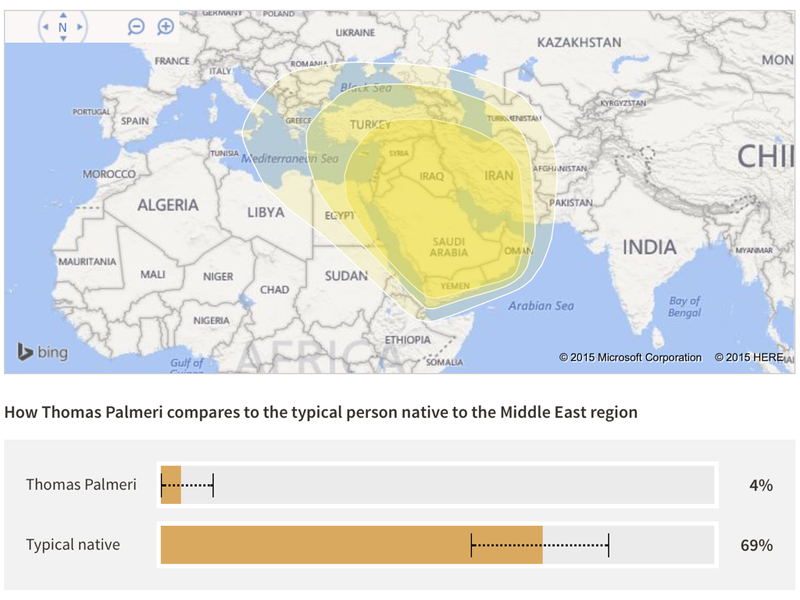 Palmeri is not a very common name outside of Buffalo, NY. I think my wife and I are the only Palmeris in Nashville. 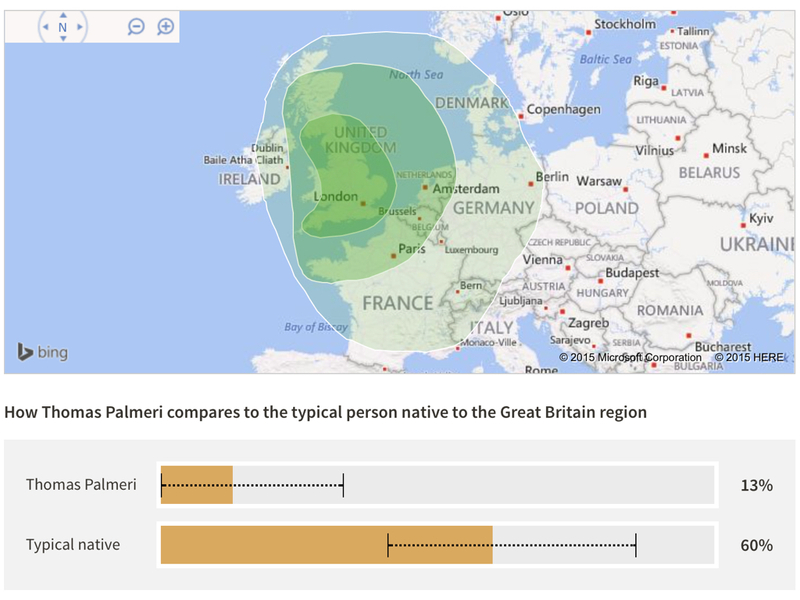 I figure that at least some of the Palmeris living in Buffalo are related. So I send out about a dozen letters to various Palmeris listed in the phone book. 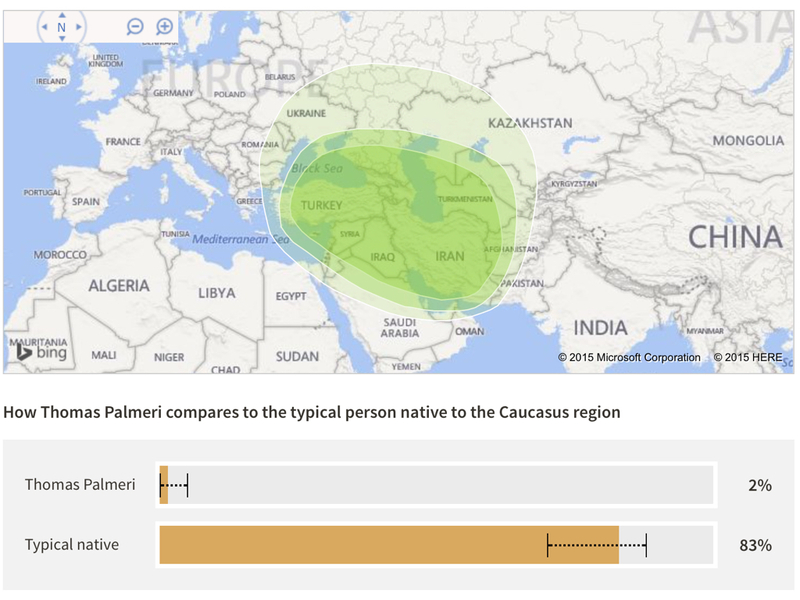 A few weeks later, I get a call from someone who turns out to be my dad's second cousin. He knows my dad, not just as family, but because they both worked for the Buffalo Board of Education. His son, who is probably about my age, received one of my random letters and gave it to him. 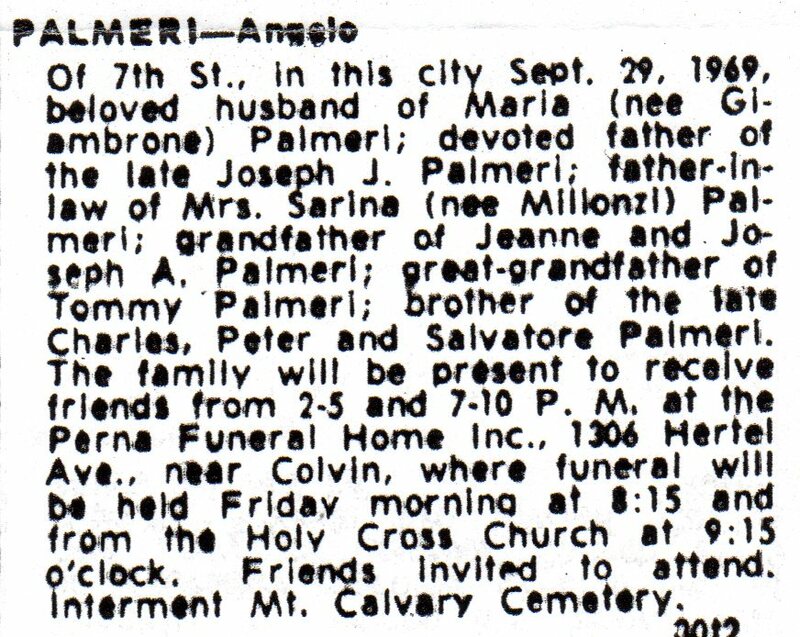 Chuck was a treasure of information about the Palmeri family. 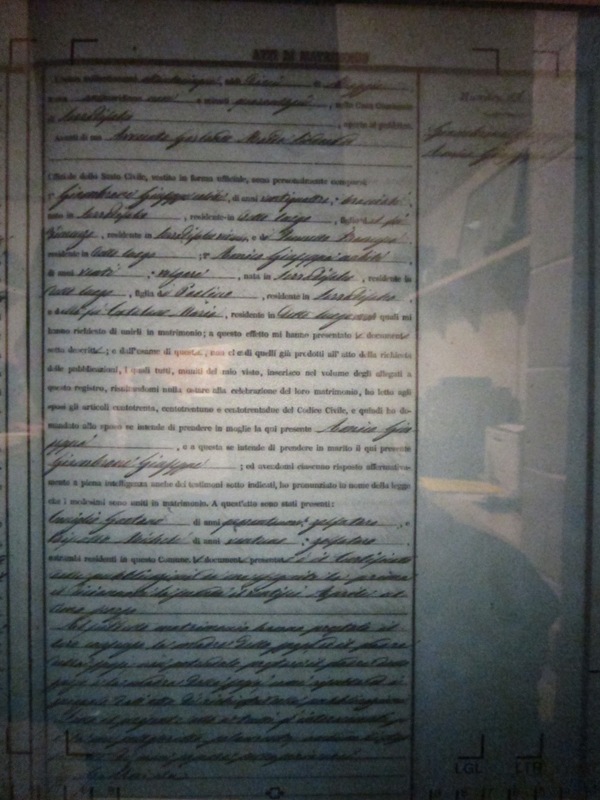 I learned that Angelo and Charles had two brothers, Samuel and Peter, who also came to Buffalo, and that they may have left a sister, Maria, in Serradifalco. 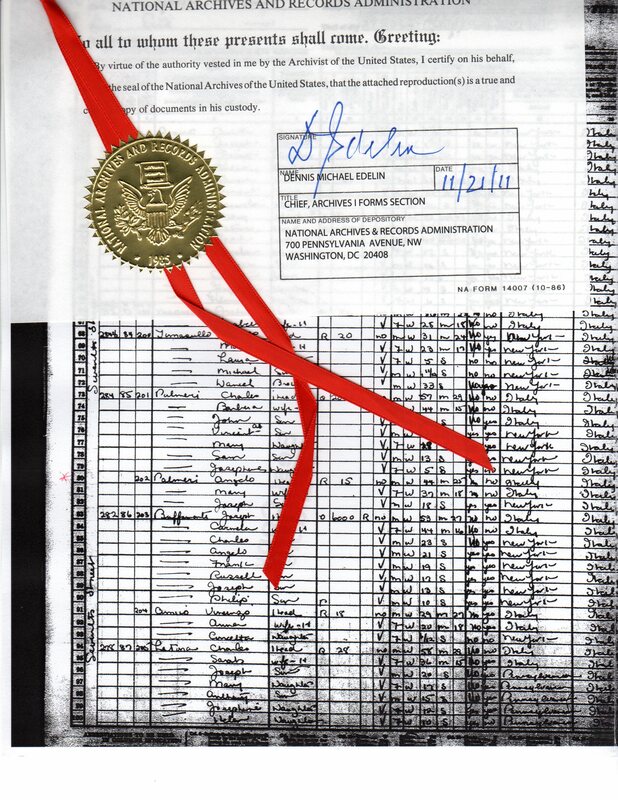 I also learn that Maria and Barbara Giambrone – I finally know their last name for sure – had three sisters and a brother who came to Buffalo and a sister who stayed in Sicily. 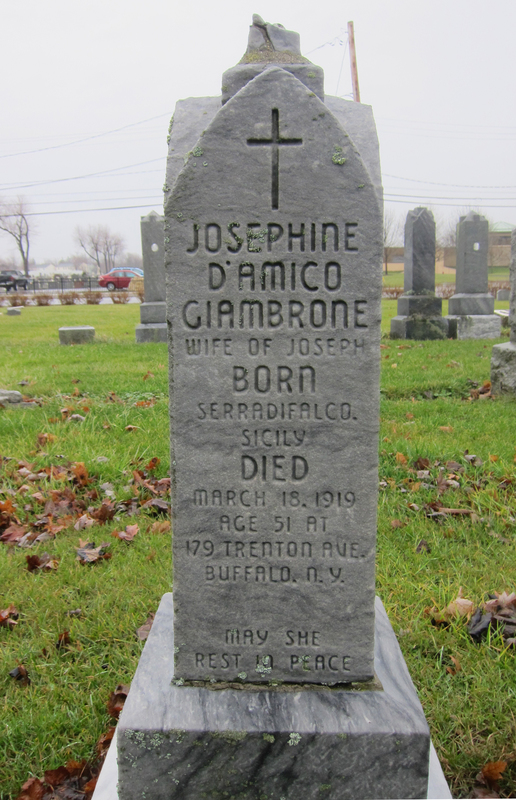 I also learn that my great-great-grandparents, Giuseppe and Giuseppa Giambrone, parents to the Giambrone clan, also came to Buffalo. I recently learned that they are buried in Mount Calvary Cemetery in Buffalo. 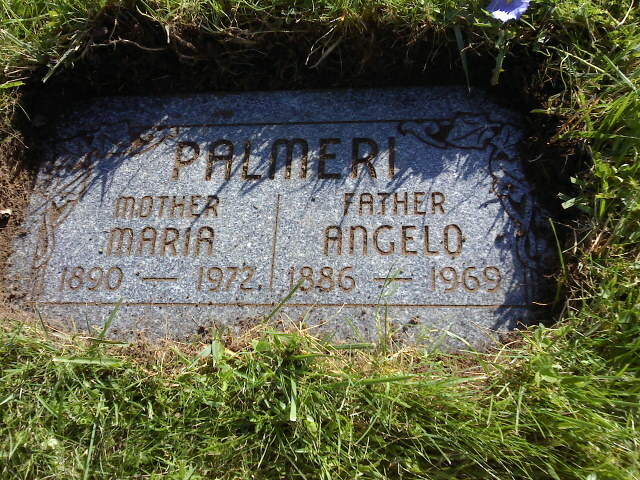 They shared information about the Palmeri family. They knew by grandfather and grandmother well. 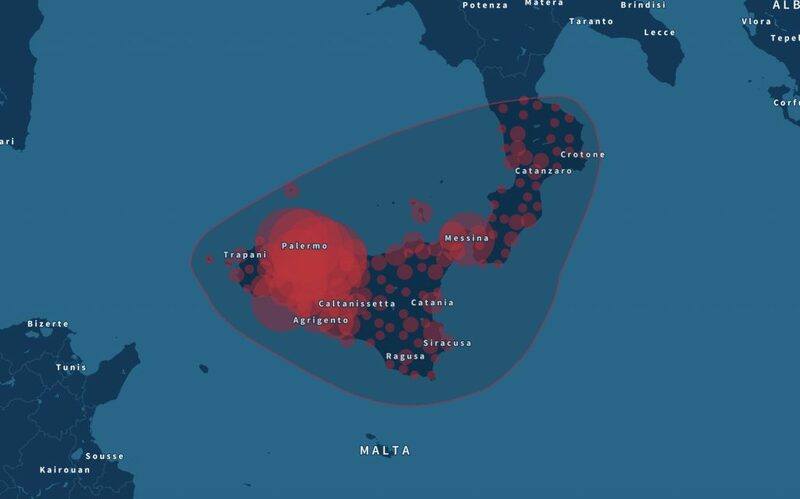 They shared information about Serradifalco, including a video that showed the homes my great-grandparents had been born in and that showed a street named after the family in Serradifalco, Via Palmeri. 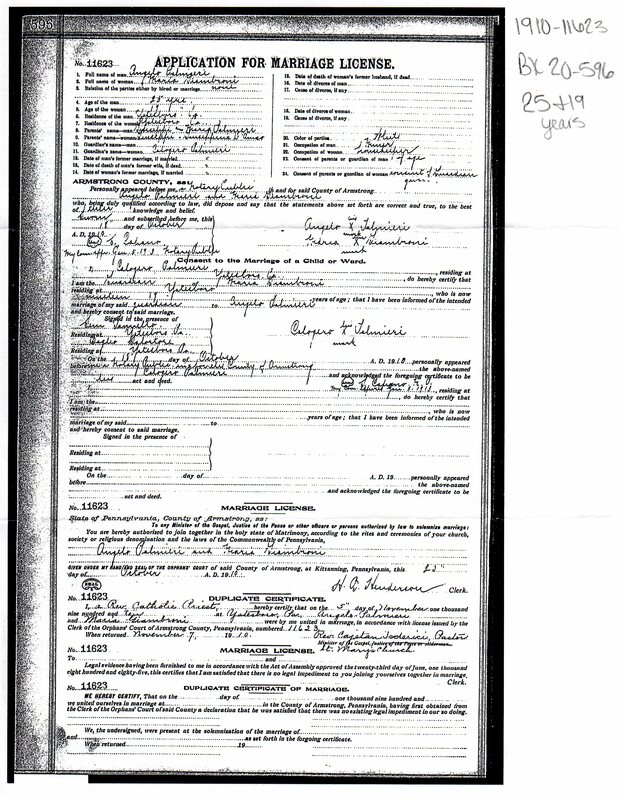 But maybe the coolest thing they shared was a story of my great-great-aunt and uncle, Charles and Barbara (Giambrone) Palmeri. 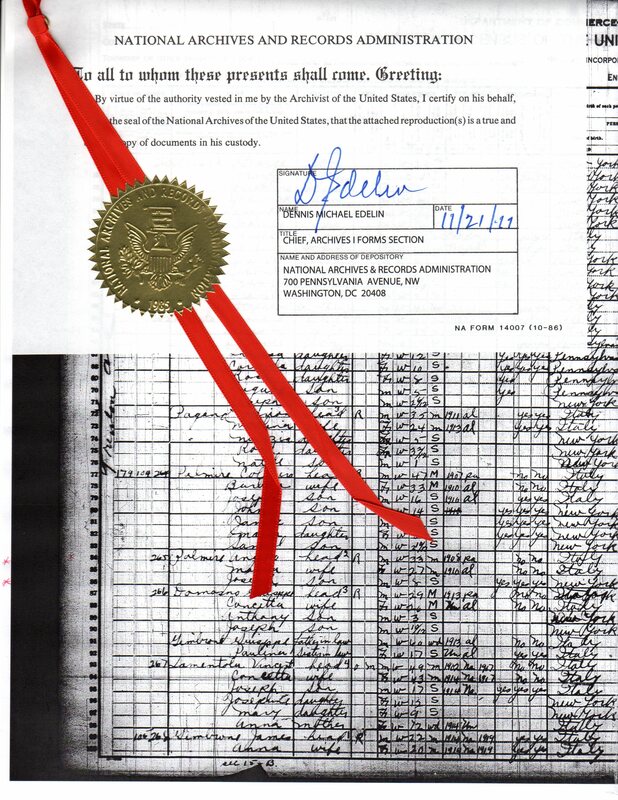 There is a lot of really interesting information in their about life as a young immigrant family. 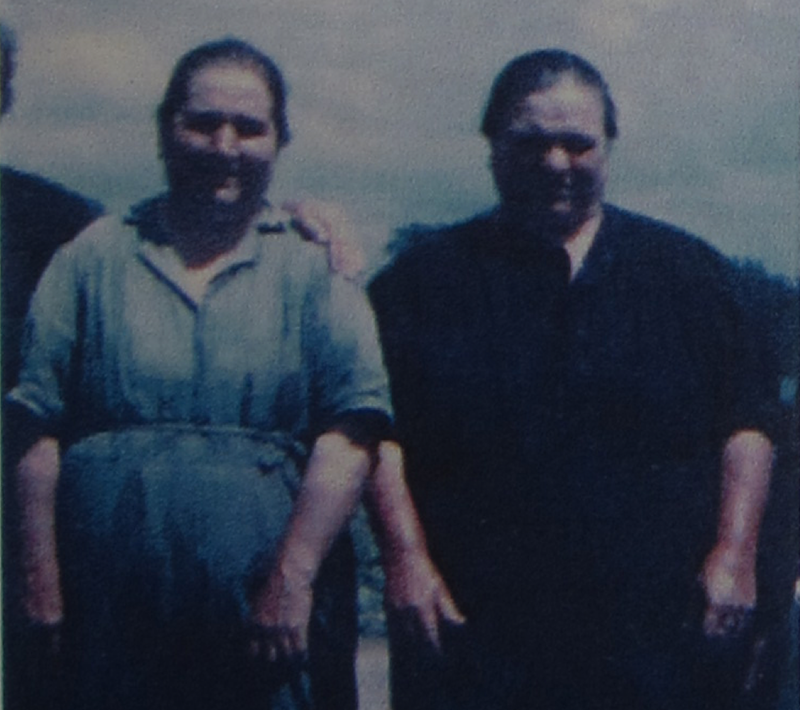 Every summer, the Palmeris and Giambrones would go to the Eden Valley to pick peas and beans. All of the adults and children would work and they would sleep in a barn. They were paid 1 cent a per pound for peas and 2 cents per pound for beans. As the boys got older, they would graduate from picking to hoeing and running machinery. 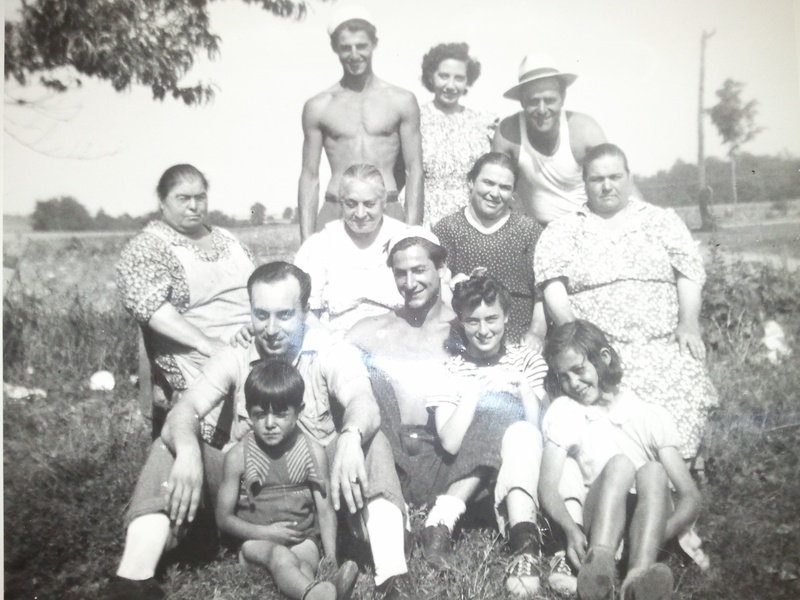 Apparently, my grandfather, Joseph Palmeri, used to go down every summer until he got married. My father remembers going down there occasionally as a child. But according to my dad, his mother had no interest in being anywhere near farm work.